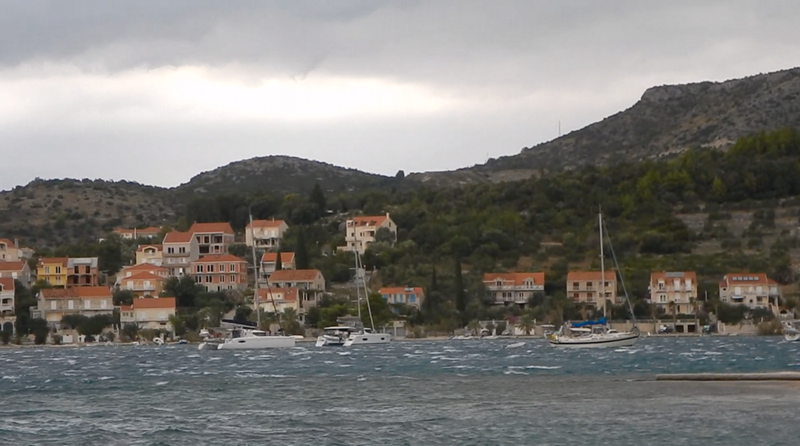 Hunkered down at the ACI Marina in Slano, we awaited Bora to blow our way. The forecast called for the notoriously strong northeasterly wind to begin gusting at 2:00pm on Monday afternoon. The forecast was spot on. At 2:10pm, Bora arrived. And literally a few minutes later, the wind increased from 5 knots to 40 knots in the blink of an eye, accompanied by a heavy downpour of rain. To be fair, dark clouds had been forming all morning. But that doesn’t necessarily indicate Bora. Sometimes Bora comes with little or no warning – a clear-air gale, it’s called. Other times, Bora does bring dark clouds and rain, like today. The scene in the marina was intense – some of the most wild wind and rain I’ve ever seen. I finished my coffee (after moving inside) and then walked down the dock to check on the boat. Everything seemed to be ok.
For the rest of the day, the skipper of buddy boat “Melanie” and I stayed close to our boats. Meanwhile, our respective crews went exploring to the nearby town of Ston (known for its wall, its salt factory, and its fresh oysters). We reviewed the forecast again, and made the easy decision to stay put for another day. During the late afternoon, I turned on the boat instruments and captured wind-speed readings of 55 knots! Fortunately, our boats were tied such that the wind was coming from astern, and blowing us away from the dock, not into the dock! Our doubled-up dock lines worked just fine. Sleeping was difficult Monday night, as the wind howled through the marina. The boat swayed back and forth a bit, but the rock seawall gave us good protection from the choppy waves stirred up by the wind. Since I had spent time in Dubrovnik during my 2016 sailing trip in Croatia, I decided to take a hike around the hills surrounding Slano Bay. Heading south out of town, I walked nervously along a narrow, no-shoulder highway for about a mile. I managed to find a dirt road that led up into the hills, so I happily followed it away from the highway. The road led to a small village. I took a short break in church and cemetery, and then headed back to Slano on a different road … after asking for directions twice! After returning to the marina, I met with Melanie’s skipper again to review the weather outlook. The forecast for Wednesday showed sustained wind of 15-20 knots, but gusts still forecast to be 30-35 knots. We were only 20 nautical miles from Dubrovnik, but there was no reason to force it. We didn’t have to be there until Friday. And the forecast showed much better (i.e., lighter) wind conditions for Thursday and Friday. I gave the crew the unfortunate news, but they supported the decision to stay put – recognizing it was for our safety. “Better to be at the dock wishing you were at sea, than being at sea wishing you were at the dock,” as the saying goes. 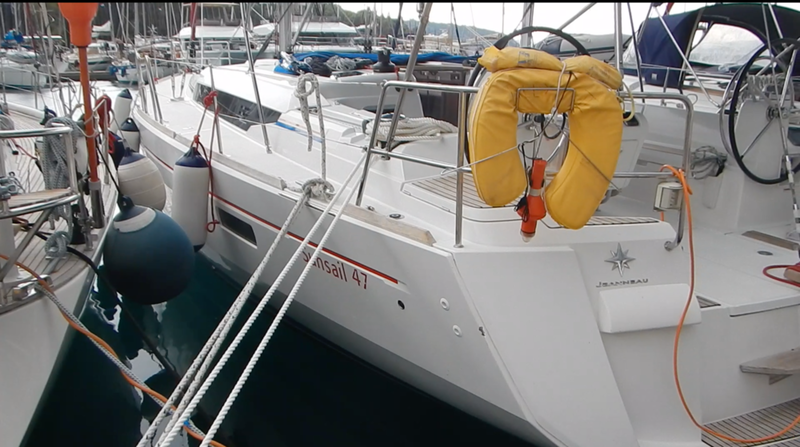 On Wednesday, two more boats from the OCSC flotilla pulled into Slano. They had waited out the Bora in Okuklje, a small village on the island of Mljet. They were well protected from the wind as well; but, as is typical in these villages, they moored at a restaurant-owned mooring spot. This was great for eating, but the restaurant didn’t offer services like showers and water. After spending three nights at the mooring and running low on fresh water, both vessels braved the gusts and waves to cross the channel to join us in Slano. It was great to see them, and had a good afternoon exchanging stories about the trip thus far. That evening, Melanie’s skipper and I had yet another forecast review. We confirmed our plan to depart Thursday morning. But where to go? There were a couple of possible anchorages where we could stop for 1 night. However, my crew in particular had expressed a preference to avoid anchoring, in favor of docking at shore, in order to maximize ability to explore without being dinghy-dependent. Thus, Melanie’s skipper and I decided we would sail together directly to Dubrovnik on Thursday. Arriving a day early would allow people to have a “free” day to do exploring on their own – perhaps even taking a ferry to the National Park on the island of Mljet. (Recall, we had to scratch Mljet from our sailing itinerary due to the wind conditions.) Once again, I relayed the decision to my supportive crew. Thursday morning arrived, and we made prepared the boat for departure – mainly undoing all of the extra lines we’d used to tie things down during Bora. The wind was light as we slowly motored out of the marina, with buddy boat Melanie following us. We hoisted the sails, turned to port, and headed south. We cut the engine and tried to sail a bit, but now the wind was too light! Such a difference a day makes! Although our plan had been to stay in the protected channel all the way down to Dubrovnik, the wind was so light (and we had a lot of time), we decided to venture out beyond the first row of islands off the coast, and look for wind in the open Adriatic Sea. It worked! And we found perfect wind as we poked out beyond the islands. 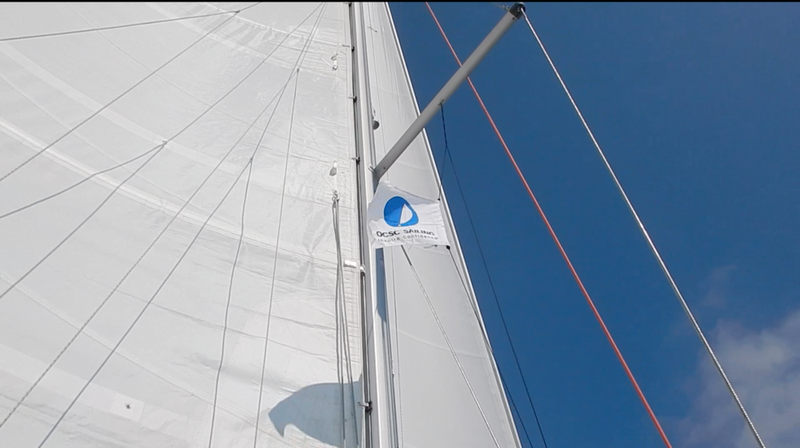 We enjoyed an hour of fun sailing, rotating crew around different positions so everyone had a chance to tack the boat a few times and work the jib sheets. Once we’d had our fill, we continued down south to Old Town Dubrovnik. We lowered our sails and motored along the city wall, and just in front of the small harbor. The small harbor was too busy with water taxis and tour boats for us to enter. We circled in front of Old Town for a few minutes, taking selfies, and then turned around and motored up an inlet just north of Dubrovnik to the Sunsail Marina. We found our mooring spot right at the marina entrance. We executed our final Mediterranean-mooring maneuver, and secured Tilly II safely at the dock. Melanie came in right behind us, and docked alongside. We opened a few beers and toasted the end of our journey, albeit a day early. On Friday, the crew set off to explore Old Town Dubrovnik again, while Melanie’s skipper and I relaxed in the cockpit of Melanie and watched all the other charter boats come in. It was non-stop “Boat TV” all day long. Boats lined up to enter the marina. Weary crews lined up to use the showers. I reflected on the benefit of being one of the first boats in. There was no line for docking; there was no line for showering. That evening, back on Tilly II, we packed up our belongings, cleaned up the boat, and got a good night of rest. We were off the boat at 8:00am the next morning. I took the bus into Old Town Dubrovnik, where I would spend two days recuperating before heading to Germany for my next adventure. Overall, the OCSC flotilla was a fantastic trip, with a great group of people. While the Bora wind caused us to deviate from our sail plan, and even cut our sailing short by a day or two, I learned a lot from the experience, and thank my fellow skippers (especially Melanie’s skipper) and the crew of Tilly II. Showing off my “skipper socks” as we make way to Slano. Doubling up the dock lines in advance of Bora’s arrival. White caps in the small Slano Bay as wind hits 50 knots. View of Slano Bay (marina is just left of center). Beautiful! After waiting 3 days for Bora to subside, we eventually made it to Dubrovnik!